Fox News chairman Roger Ailes could not have scripted this better if he'd tried. Two weeks ago CNBC's GOP debate was widely panned. Now Ailes' lower-rated rival channel, Fox Business, has a chance to be the anti-CNBC. Ads for Tuesday night's event promise that it'll be a "real debate" — a not-so-subtle reference to CNBC's shortcomings. Ailes "got a kick out of the debacle," a source close to him said. He wants there to be a clear contrast between CNBC's chaotic "battle in Boulder" — where the candidates turned on the moderators — and a much more controlled Fox Business debate. "This is an opportunity for us to make sure the world knows what the Fox Business Network is," moderator Maria Bartiromo said in a debate-eve interview. The channel has been creeping up on CNBC, but its Nielsen ratings remain stubbornly low, with about 100,000 viewers at any given time last month, half as many as CNBC. This debate is likely to attract 10 million. That may be particularly satisfying to Ailes, who ran CNBC in the early 1990s, and Bartiromo who worked at CNBC until just two years ago. "This puts the FBN team in front of more eyeballs than ever before," former Fox Business executive Ray Hennessey said. "Hopefully they stay and sample the programming in the days after. That will be the real test." Fox Business has never hosted a debate before. The channel launched in 2007 in the shadow of its much bigger brother Fox News. Ailes is the chairman of both. Many of the people who produced Fox's well-reviewed GOP debate are in charge of this one, too. But the moderators are different — Bartiromo, Fox anchor Neil Cavuto and Wall Street Journal editor in chief Gerard Baker. All three have decades of business journalism expertise. What the Republican National Committee wants is a two-hour debate centered on the economy. One of the knocks against CNBC is that the moderators too often strayed into other topics. On Fox, "You're going to actually have a debate about the economy, about taxes, about trade, about veterans unemployment — things that the CNBC debate was supposed to be about," RNC chief strategist Sean Spicer said on Sunday's "Reliable Sources." Bartiromo concurred, but said recent campaign news, like media scrutiny of Ben Carson's life stories, will also come up. "When you have an elephant in the room, I think you have to address it," she said. Some of the candidates might bring up complaints about media bias generally, but they are unlikely to target the moderators directly, since Fox is the favored television network of the right. Bartiromo said she thought "what President Obama said is right," and quoted the president's recent dig at the complaining GOP candidates: "If you can't handle the moderators, how are you going to handle China and Russia?" The candidates might have less reason to gripe because they'll have more time to talk. There will only be eight candidates on stage, down from 10 last time. (Four lower-ranking candidates will be at the "undercard" debate earlier in the evening.) Debate rules call for 90-second answers (up from 60 seconds previously) and 60-second rebuttals (up from 30 seconds previously). 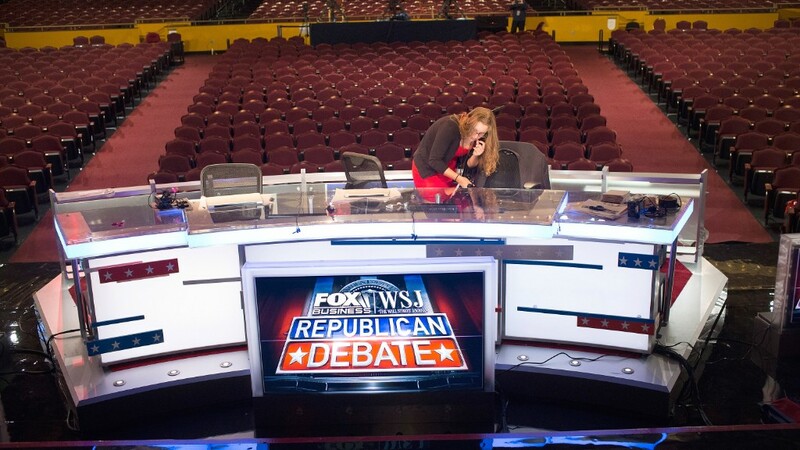 And there will be a buzzer to indicate when a candidate has run out of time — which Fox staffers say is a much better cue than a moderator interrupting the speaker. Primary debates tend to be tailored to the party's voters. Bartiromo said that "for the most part, this is for Republican primary voters to better distinguish between these economic plans." "But this is also a test for the broader public," she said, which has demonstrated by the huge audiences they are drawing. Cable news debates one year before general election day used to get 2 or 3 or 4 million viewers. But this year, thanks in part to Donald Trump, viewership has soared. 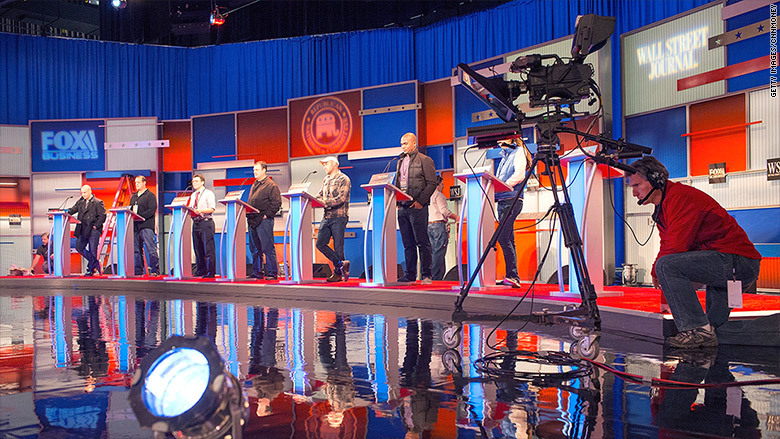 August's GOP debate on Fox News averaged 24 million viewers. CNBC's debate averaged 14 million, still by far a record for that channel. Fox Business isn't as well-known as CNBC, which is why it is promoting a channel finder tool on its web site. But its bigger brother network is helping to get the word out about the debate. And Fox's web site is live streaming it for free so that people who don't have the channel can watch. Fox "gets to show off its talent immediately after its main rival is perceived to have stumbled," Hennessey said. Lou Dobbs will anchor live coverage in between the two debates, Cavuto will anchor right afterward, and John Stossel will have a special edition of his show at midnight. The network is also running ads for a new season of its highest-rated show, the documentary series "Strange Inheritance," during the debate and premiering four new episodes the next night.